The crew stopping at the first junction: Brook, Sean, Eileen, Elizabeth, Danny, and Nicola. What a cool looking crew, I might add! I like the idea of destination races: you get to do a race that is unique plus you get to travel! Sounds like a great deal to me, especially when combined with some vacation time before and after the race. 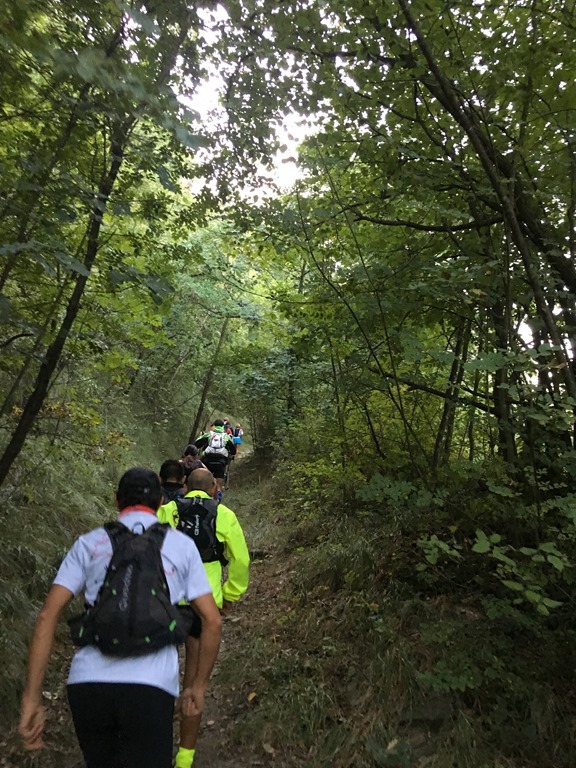 Having run the Prague Marathon three years ago, it was time for another destination race in Europe, this time a small and relatively unknown trail race in northern Italy on September 25th. 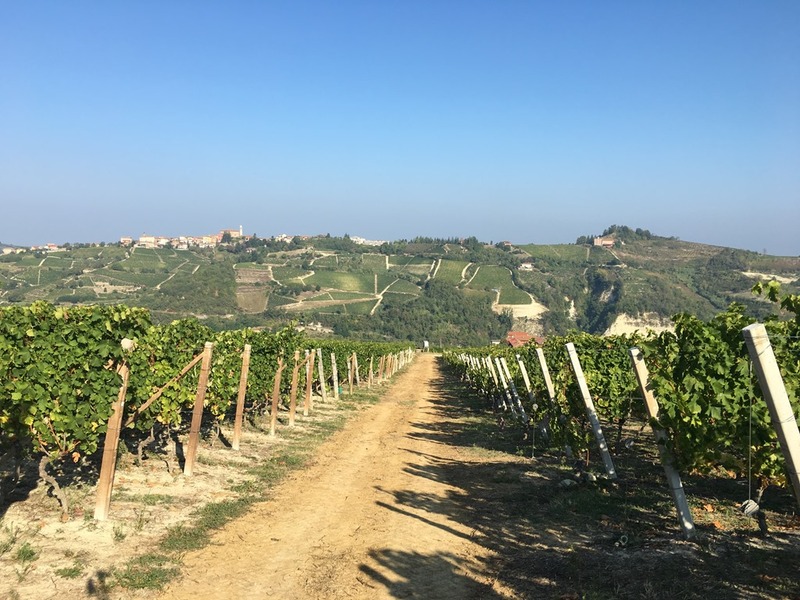 Suzanna and I registered for Trail del Moscato, a set of small races running through the terraced vineyards of the Piedmont region of Italy. Suzanna signed up for the 21K Nordic walk and I for the 54K run, serving up 9,186 feet (2,800 meters) of elevation gain over 54 kilometers. The previous 50Ks I ran had 4-5,000 feet of gain, so I knew this was a bit of a jump in elevation, but somehow I didn’t realize the true significance of the difference. Maybe in retrospect that was a good thing because if I had, I likely wouldn’t have signed up for this crazy-tough Italian trail race. 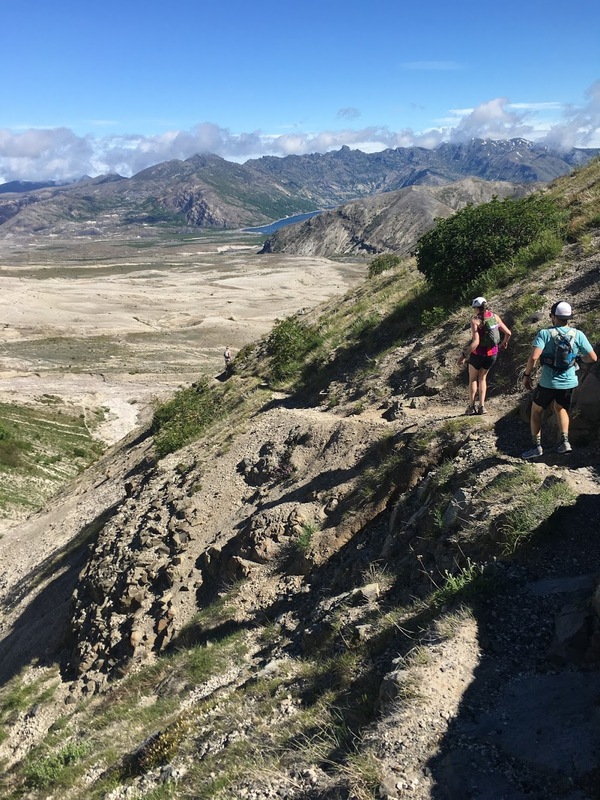 Ultrarunning magazine categorizes races on a pair of 1-5 scales: one for elevation profile and one for surface, with 5 being the highest category for each. 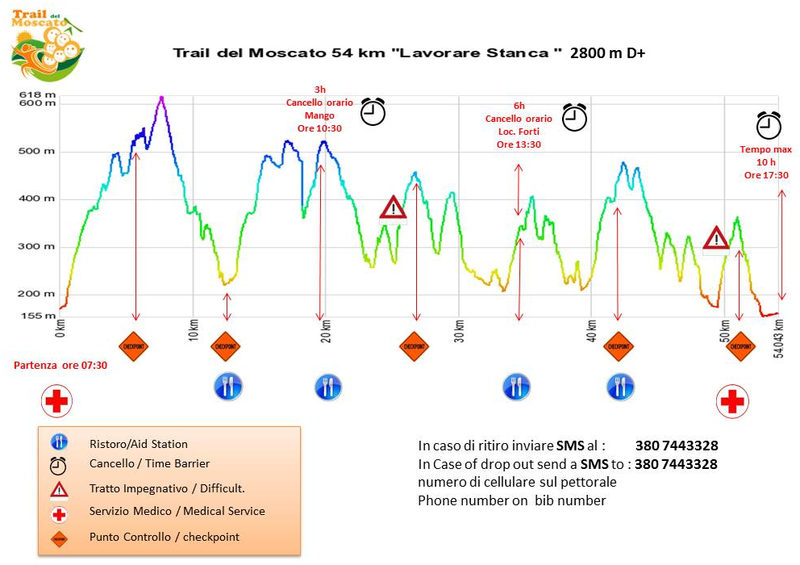 Trail del Moscato scores a 5 on the elevation profile based on the fact that’s there’s over 250 feet of climb per mile! So it wasn’t just me – it was extremely difficult! 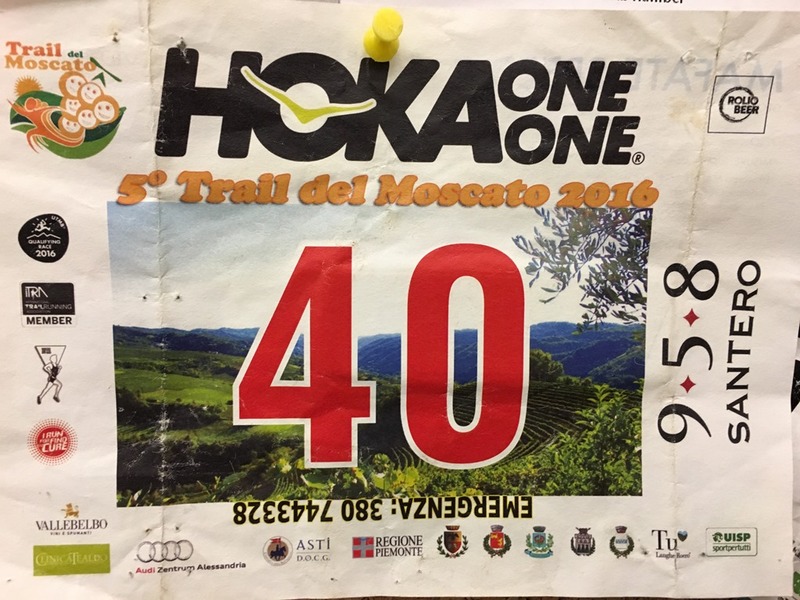 Trail del Moscato is a loop course that starts and ends in the tiny town of Santo Stefano Belbo. The start was set for 7:30 am, following a 10 minute pre-racing briefing in Italian. I didn’t understand a word of the briefing. 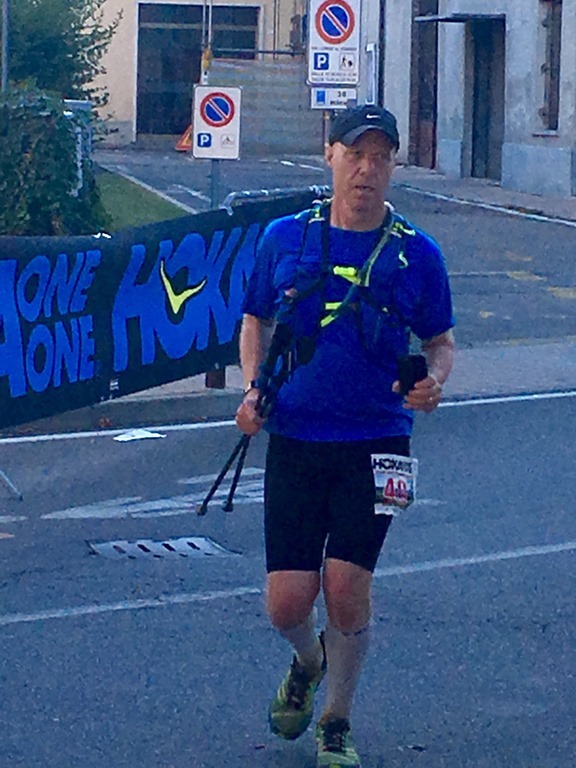 Nor was I able to communicate with any of the race officials or other runners since unlike in the big cities like Rome or Florence, very few people in Santo Stefano Belbo spoke much English. Still I wasn’t too concerned since I had studied the race website which included English versions of the key pages. About 50 of us lined up at the starting line. The gun went off and we ran a few hundred feet across cobblestones and concrete before cutting right into a dirt trail that went up for a few miles. Around a third away up the first hill, just before my watch alerted me to mile one, the race suddenly became more of a challenge as I heard a buzz in my ears as a swarm of bees, undoubtedly disturbed by earlier runners, attacked me from behind managing to sting me around 8 times in my right thigh, left buttock, and, worst of all, in the base of my skull. The pain was pretty jarring and lasted for most of the race. Worst of all it gave me a pretty nasty headache. A few seconds after my unfortunate encounter with the bees I heard another runner scream so I know at least one other runner was stung. 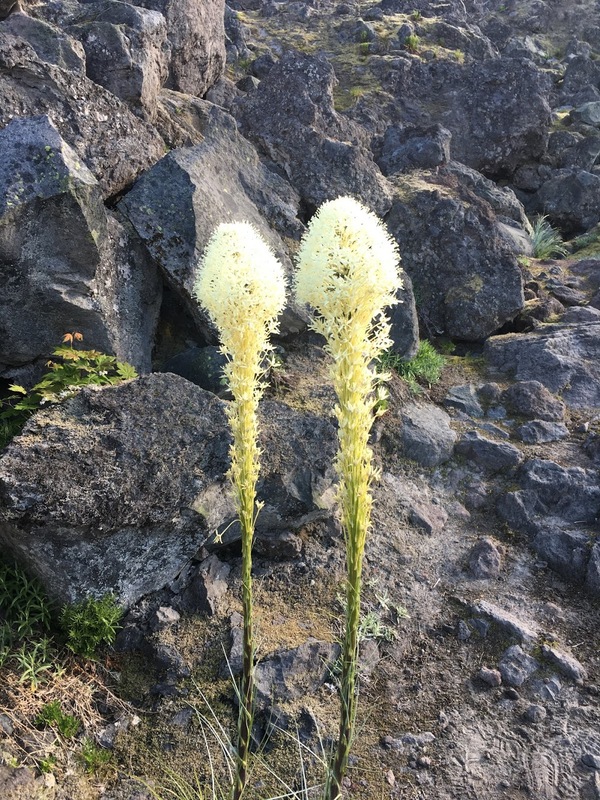 With the pain of the bee stings unrelenting and fearing, with that many bee stings, I might suffer an allergic reaction, I took a Benadryl pill that I had in the pill pocket of my hydration pack. Worrying more and more about the bee stings, I downed a second Benadryl tablet a few minutes later. 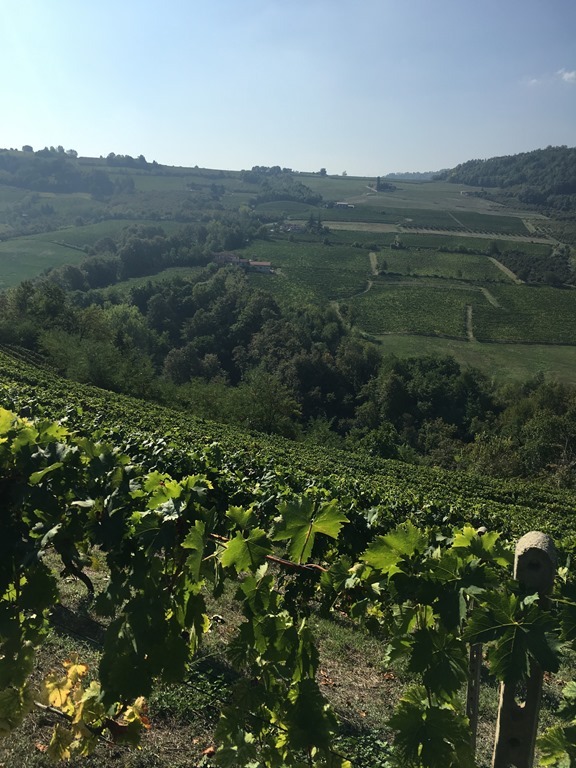 About 75% of the race is on trails up, down, and through the terraced vineyards and spectacular views of the valleys below with grapes surrounding almost every step of your way. Another 20% or so of the race was through forested areas with the remaining 5% through a handful of small towns. 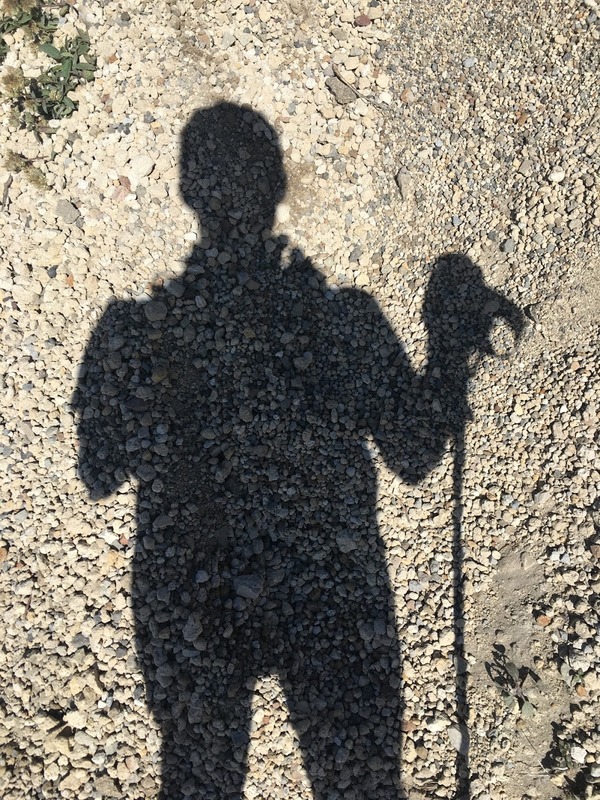 The uphills were steep and relentless, with my trekking poles coming in mighty handy. The downhills were sometimes so steep you were pretty much doing a controlled slide. The flats were few and far in between. It was almost constantly up and down. As you can imagine, with only 50 runners over 54K, I ran the majority of the race alone. Still, I managed to hook up with some other trail runners for a few good stretches. 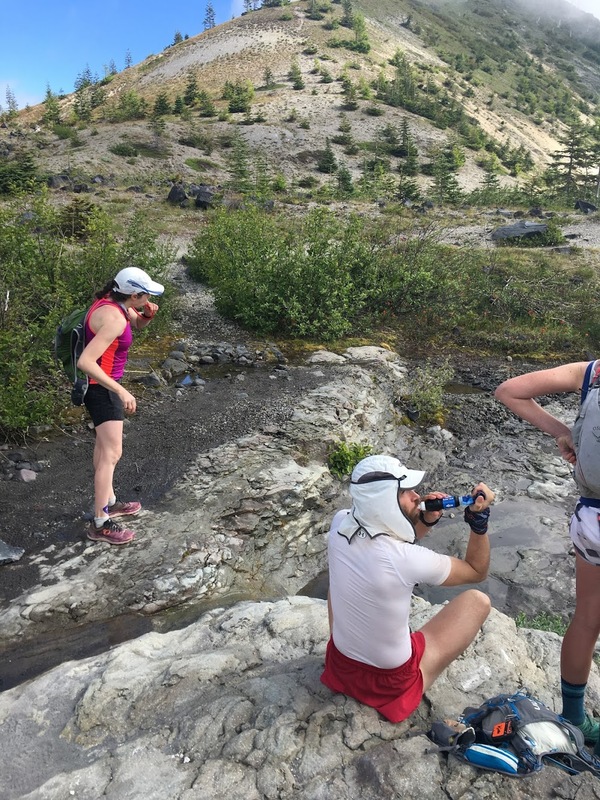 The aid stations were pretty basic, supplying water, an electrolyte drink, and a few food items. I carried plenty of food so I didn’t need any and refilled my hydration bladder about half way to which I added an extra package of Tailwinds Nutrition powder. And every so often I picked a few grapes. 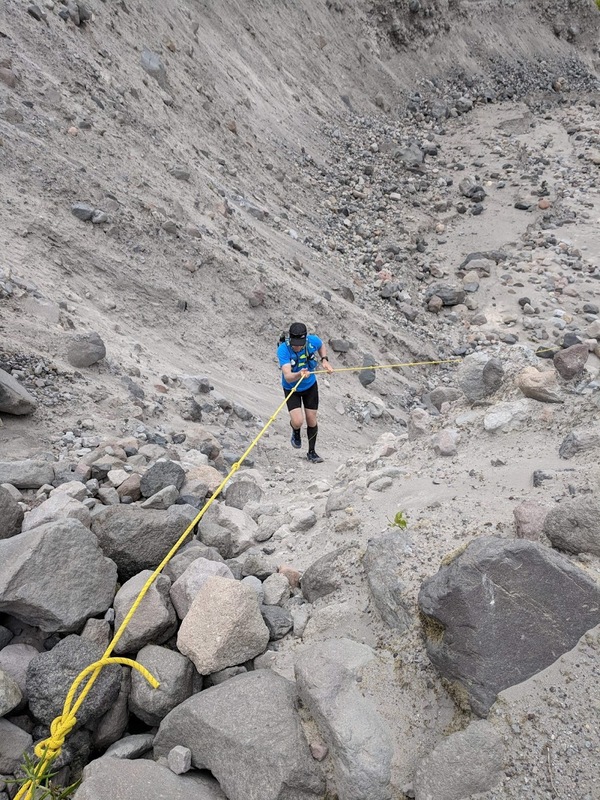 Between miles 16 and 17, about four and a half hours into the race, I reached the top of a very steep downhill section and started running down. I reached the bottom of the hill after running and sliding for about a quarter-mile, though the steepness of the hill made it seem much further. But there had not been any race flags for a while. When I got to the bottom, I soon realized that I must have missed a turn. Many sighs and a few curses to myself later, I reluctantly turned around and struggled back up about 7/8 of the hill until I located the missed turn. Fortunately, I had my running poles; without them, I am not sure what I would have done. This, mistake took a lot out of me, both physically and probably more important, psychologically. I achieved another low point a few miles later as I reached what I thought was the 4th of 5 aid stations, I took my race map out of my pack, pointed to aid station 4 on the map, and grunted something that I am sure was indecipherable to the volunteer working the aid station, so that they could confirm that I had reached 42 K or 26 miles (marathon distance). The volunteer pointed instead to the third aid station at only 34 K (mile 21). A difference of only 5 miles, give or take a few kilometers, but it seemed a world further and I immediately descended into a funk. 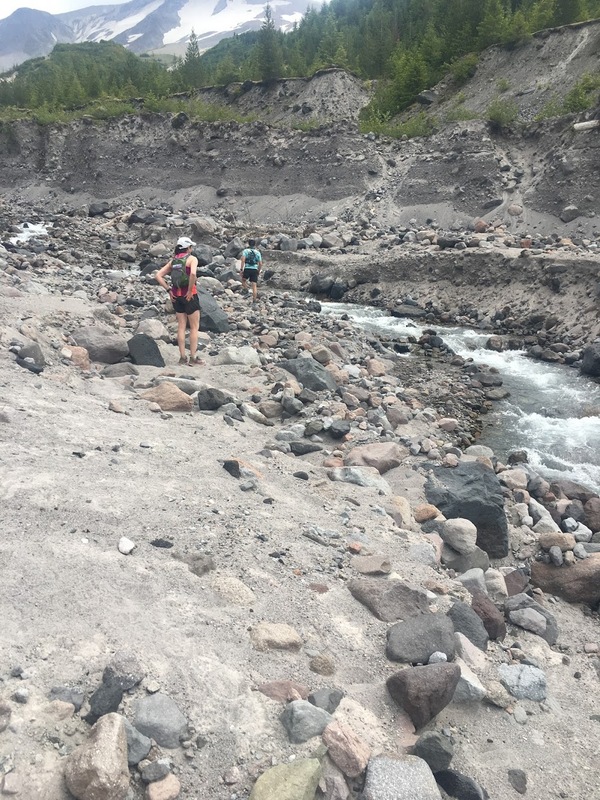 At this point, I was having trouble keeping it together, suffering from the bee stings, GI distress, the hot sun, and of course, the relentless uphills. Somewhere between aid station 3 and 4, I slowed down quite a bit. When I finally got to the aid station that I thought I had arrived at earlier, I tried to communicate to the volunteer that I was done, spurting out some badly broken Italian while using the international sign for the end (moving the palm of my hand across my throat). I think he understood me but could offer no help in getting back to the start. 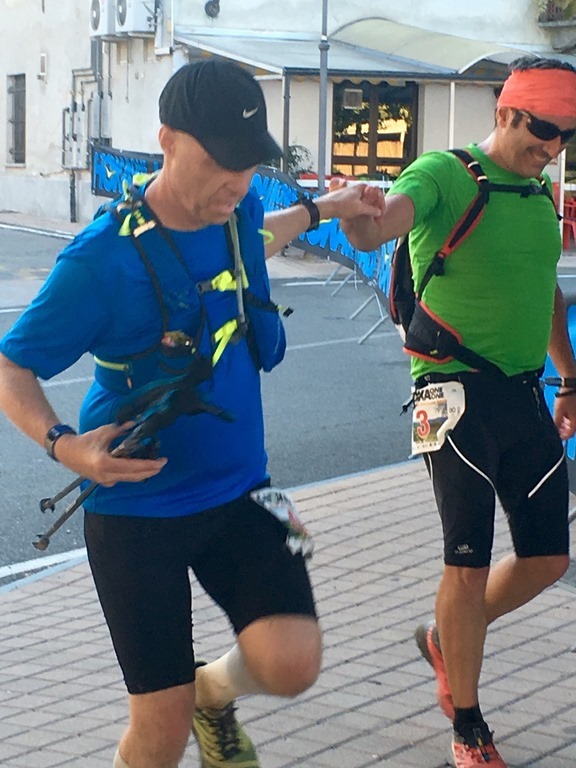 It was at this moment, that another runner who had just arrived at the aid station, Massimo, spoke to me in English, much to my relief. He told me he we only had around 12 kilometers to go. Massimo too was hurting, finding the downhill running especially difficult and suggested that we stick together. He also mentioned that there was another runner just ahead of us and if we caught up to him we could all run, or practice something resembling running, together. I remember at this point that Massimo and I discussed the 10-hour cutoff in the race and the fact that we might not make the cut. Finally having someone to run with and someone who spoke my language – literally – was a huge relief. At the same time, 12 K seemed like an infinite distance away. We caught up to the other runner and the three of us worked together. After a bit we caught up to a woman, so now there were four of us running, more or less, together. And while the others seemed to suffer caution on the downhill sections, I drew energy from the downhills. And it turns out we soon came upon a long downhill section of the course about 2 miles long, so I ran ahead of the group. In fact, at this point, I thought that I would finish in under 10 hours, especially if the downhills continued to the finish. If I had been a little less delirious, however, and stopped to consult the map, I would have realized that there were three significant hills left in the race. About half way up the second hill, I was out of fluid and pretty much out of energy, having perhaps expended too much energy during that downhill stretch. So I sat down on the side of the trail and rested for about 5 or 10 minutes. While I rested, one of the runners I had been running with earlier passed me. I got up and continued to climb the second hill, but after a brief downhill section the course flattened out for a bit and the last hill came into my view, which climbed a steep 600 feet over about 3/4 of a mile. At this point, the site of that hill broke any shred of confidence that remained in my mind and I again descended into a very dark place. I’m sure it didn’t help that I had taken two Benadryl earlier in the race; I was so exhausted; so tired and craved sleep. At the same time, my Garmin watch gave out and went blank. What a metaphor for how I felt at that moment. So I laid down on the side of the trail and took a nap. I’m not sure how long I slept there on the trail but I woke up as one of the remaining two runners, the woman, passed me. I started to get up but laid back down and feel back asleep. Finally, Massimo caught up to me and urged me to rise and finish the race with him. He asked me if I had any water left, and realizing that I was out, he gave me the few ounces that remained in his bottle. I took half and returned the bottle to him, very appreciative of his incredible act of kindness. A short while later, the race sweeper – a guy on a bicycle who I had seen once or twice previously – caught up to the two of us and asked how I was doing (in Italian). Massimo told him that we were going to finish together and that we were out of water. The sweeper took off on his bike and returned 10 minutes later with water for our bottles as we crawled slowly up that last hill. At the top of the hill at 52 K (32 miles), a number of race volunteers cheered for us and offered us water. There was a chair there and I recall sitting down as Massimo chatted with the volunteers. After resting for a few minutes, we refilled our water bottles, and walked down the hill together towards the finish line. I managed to reenergize a bit on the downhill and could have run most of that last 2K but decided to stick with my new friend who was struggling on the downhills. Once we reached the town of Santo Stefano Belbo and spotted the spire of the Sacred Heart of Jesus church, we both got pretty excited and started running. Our excitement was tempered a bit when we realized that the course didn’t go directly to the finish line but instead looped annoyingly through the town. But we kept running, perhaps a little slower, when we realized there was more to run than we had first thought but soon enough we neared the finish. 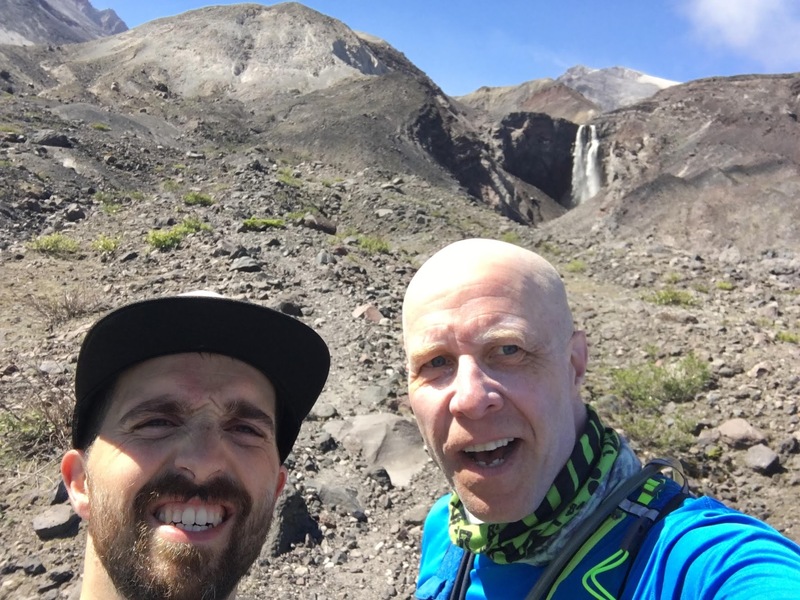 Massimo and I finished 51st and 52nd of 52 finishers (i.e., dead last), but I am still very happy to have competed in and completed Trail del Moscato. It was a brutal but beautiful race and stretched me to the edge of my being, but I survived and am better for it. As Scott Jurek would say, it’s all about digging deep inside of yourself to find what you didn’t know was there. And having a friend there to urge you on, doesn’t hurt either. Although Fall training had been a bit tentative because of a lingering left ankle sprain (which I rolled a few steps from the end of a hike with the kids back in July), the Deception Pass 25K race (December 2015) went okay and training for Orcas 25K was going well. Unfortunately, I rolled the ankle hard at the Orcas race on January 31 and, while I was able to “run it in,” I had suffered a pretty bad sprain, and I ended up taking 6 weeks off from training. 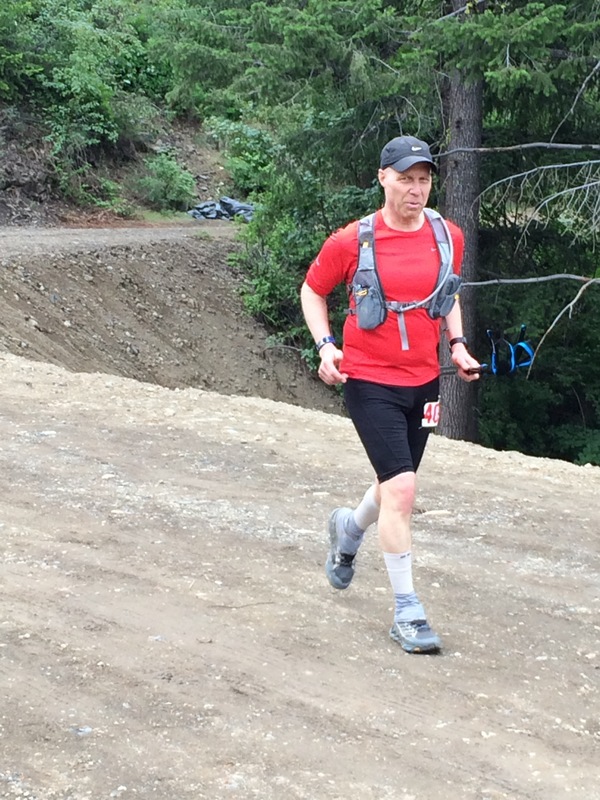 I was scheduled to run the Chuckanut 50K in March but was able to obtain a refund from the race director (the RD of Chuckanut, Krissy Moehl, was wonderful I might add) and set my sights instead on Sun Mountain 50K in May 2016. 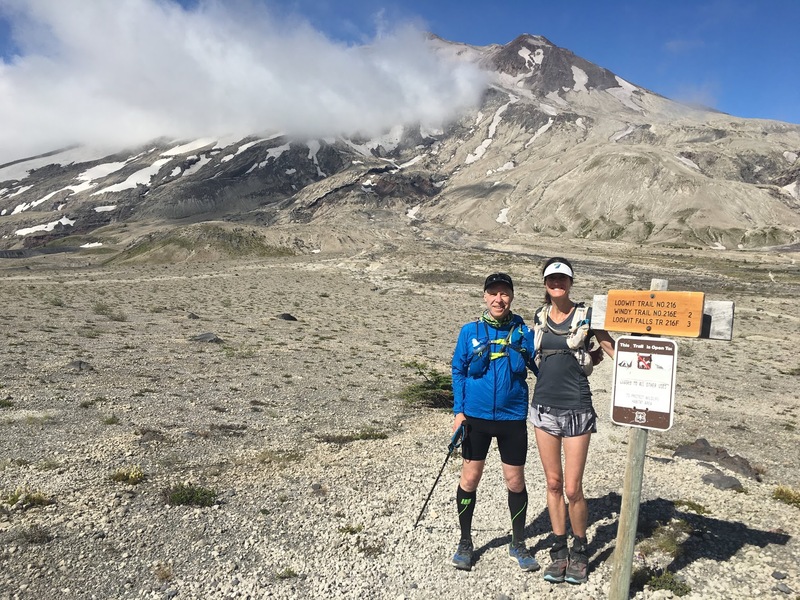 Slowly, with the help of my coach, Alison Naney of Cascade Endurance, I was able to put in place a training program that would get me ready — though far from optimally — for Sun Mountain. Now, for me, an optimal training schedule for a 50K trail race would involve a slow buildup of mileage with a peak of the longest run being in the 20+ mile range (or 5-6 hours) occurring around 3 weeks pre-race day. But Alison came up with a plan that would have me a bit under-trained but more or less ready with a peak long run of 4 hours at 2 weeks prior to the race. Sub-optimal, yes, but it would have to be good enough given the 6 week layoff for the ankle. So all was going pretty well. 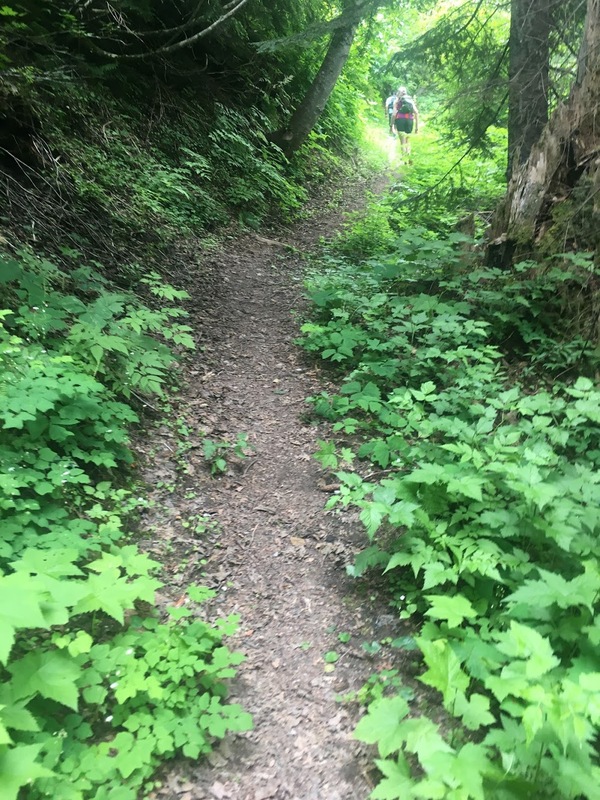 Four weeks pre-race, I had a great 3 hour run on the Chuckanut course near Bellingham and a week later had a good 3 1/2 hour run at Cougar Mountain. Unfortunately, the good running karma took a break when two weeks before the race I rolled my ankle again on what was supposed to be 4 hour run from Snoqualmie Point to Rattlesnake Lake but ended up being only 2 hours with some collateral damage. The good news, though, was that I was able to run 3 days later and had a few good one-hour runs later that week. 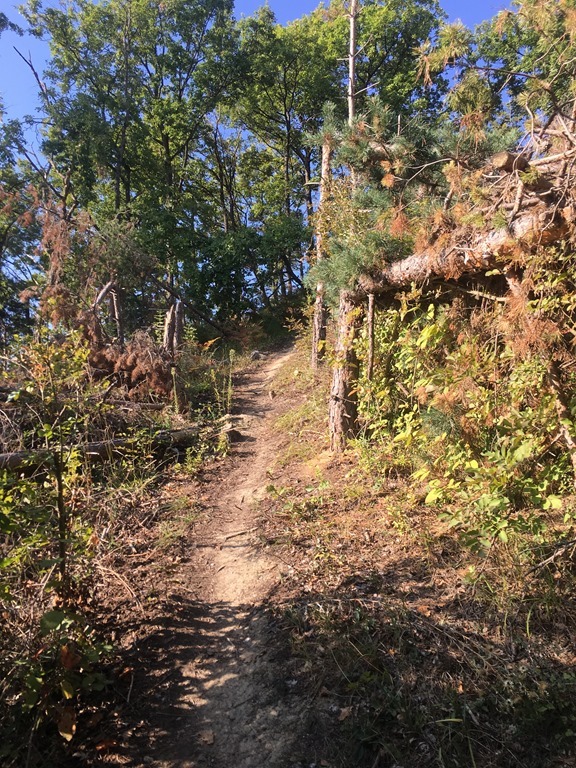 That Sunday (6 days pre-race), I set out for a 2-3 hour run at Discovery Park but ended it early when my ankle started feeling stiff and then hurting whenever I landed after scaling a log. Now any runner will tell you that this was not going well. Your ankle should not be hurting with less than a week to go before a major race. Furthermore, if by some strange miracle, my ankle was okay on race day, there was this little matter of being under-trained for the race. Still, I decided not to panic just yet and was thankfully able to snag an appointment with my wonderful ultrarunner physical therapist, Alison Gillespie of Real Rehab (yes, both my coach and PT are named Alison). Thankfully, Alison was reassuring. She worked on my ankle, suggested I take a few days off from running and that I try instead some spinning or biking to get the blood flowing to the injury without bearing weight on it. Best of all, Alison told me she thought it was okay to run the race on Saturday, and worse-case-scenario, there were several points during the race that came by the start so if I needed to drop, I easily could. At this point, my confidence was less than spectacular, but I nonetheless followed PT Alison’s advice and rode my bike Tuesday, Wednesday, and Thursday and held off doing any running. To make matters even worse, my ankle was hurting on Thursday riding home from work, which I figured was not a good sign. Because of my concerns of keeping the ankle from swelling any more, I decided not to run the entire week. 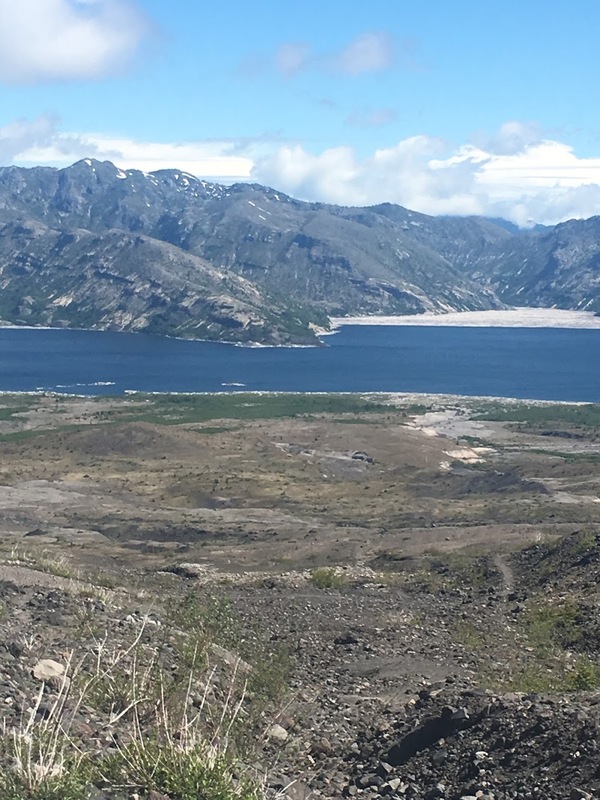 Well, the hotel was booked, I had always wanted to visit Winthrop and the Methow Valley, and I wasn’t going to get refund from my race entry fee, so I figured I’d give it a whirl despite my misgivings. Those last few days, I worked hard on staying positive while remaining realistic. Listen, I’m not some crazy ultrarunner hero; I wasn’t going to keep running if my ankle was really hurting. But on the other hand, it was a no brainer to at least start the race. We took off for Winthrop Friday morning and the drive there along Highway 20 was beautiful. I sat in the back seat with my leg propped up while Suzanna supportively did all the driving. Suzanna and I discussed race strategy, prepared my drop bags, discussed where she would be able to see me on the course, and how I would communicate to her if I dropped. Saturday morning arrived and I was the first runner to check in. After chatting with some runner friends and coach Alison, and visiting the porta-potties at least 3 times, I was ready to start the race. The race started at 10 AM and I have to say right off the bat, I felt crappy. At mile 3, I seriously contemplated turning around and heading back to the start. I just wasn’t feeling it. About that time, Coach Alison’s husband Sam (also a Cascade Endurance coach) was there cheering me (the first of three times I saw him on the course; thanks, Sam.) A little after that, a voice in the distance from above shouted “Paul, I see you” which surprised me, especially since I couldn’t see where exactly the voice came from but I was pretty sure it was Suzanna which made me smile. 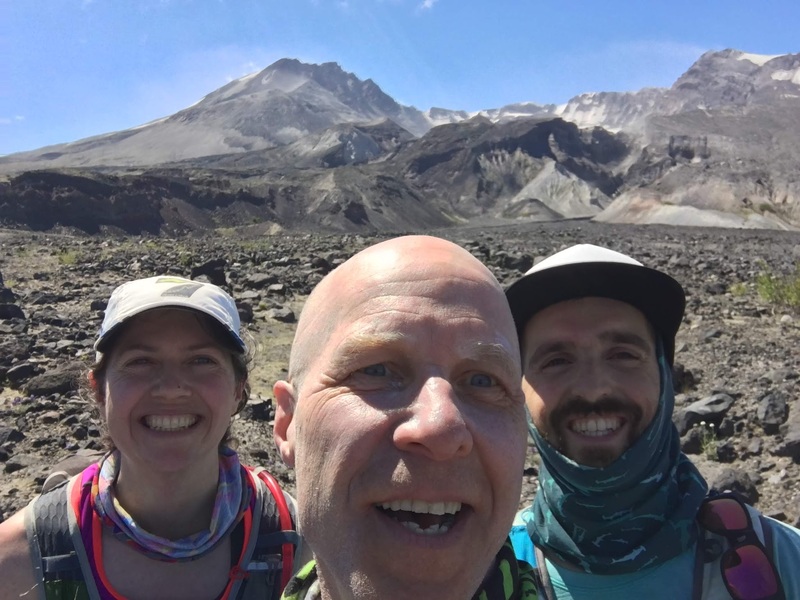 I clamored on and finally settled in a couple of miles later with a a pair of runners (Kari and Broeck). Having other runners to chat with was great and really helps when one is thinking of how horrible they feel. We made it to the first aid station at Thompson Ridge at mile 8. I grabbed a few grapes and headed back out. At this point the ankle was feeling okay and while I wasn’t feeling great, I was okay. A few miles later, I fell back and lost touch of my two new friends. 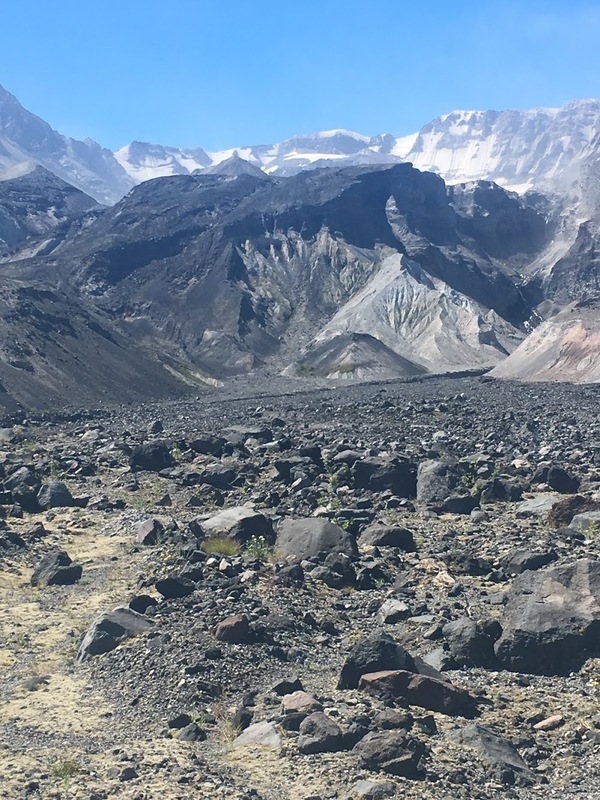 My thinking soon devolved into whether I’d drop out at the second or third aid station, or maybe there was the slightest of chances that I might tough it out I finish the whole darn race. The ankle continued to be fine but now my right side which I had strained a few weeks earlier doing some plyometrics drills started hurting. Lest I only whine about the pain and hardship, I should mention that the course was beautiful. 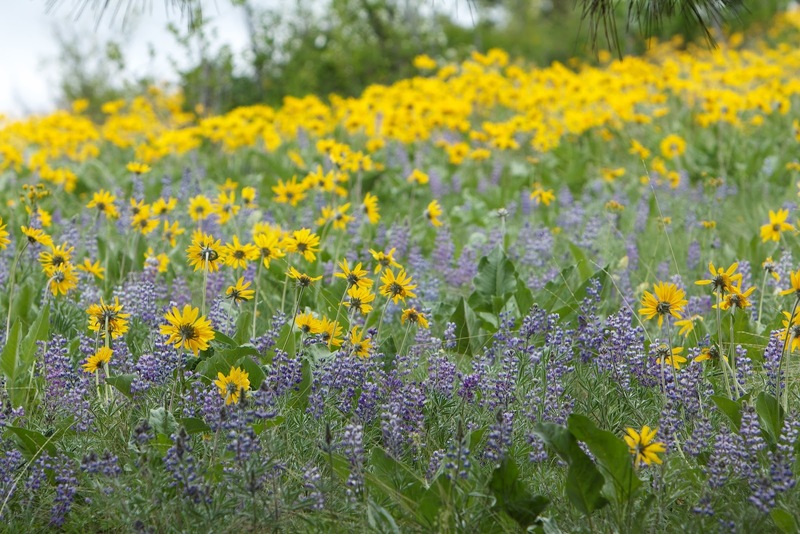 Yellow and purple wildflowers were everywhere; the valley was so colorful surrounded by gorgeous mountain peaks and sweeping views. The second aid station, Homestead, was supposed to be at mile 17 but my watch was telling me that it was mile 15. Nevertheless, I was happy to make it and see Suzanna and Porter (our black lab). I sat down for a few minutes, refilled my hydration pack, ate a few grapes, kissed her goodbye, and headed back out onto the trails. Soon, we began a long climb up Black Bear trail. I got my running poles out which helped ease the ascent. It was tough but what really hurt was the descent down Black Bear. At first my right side pain came back and then my hips. 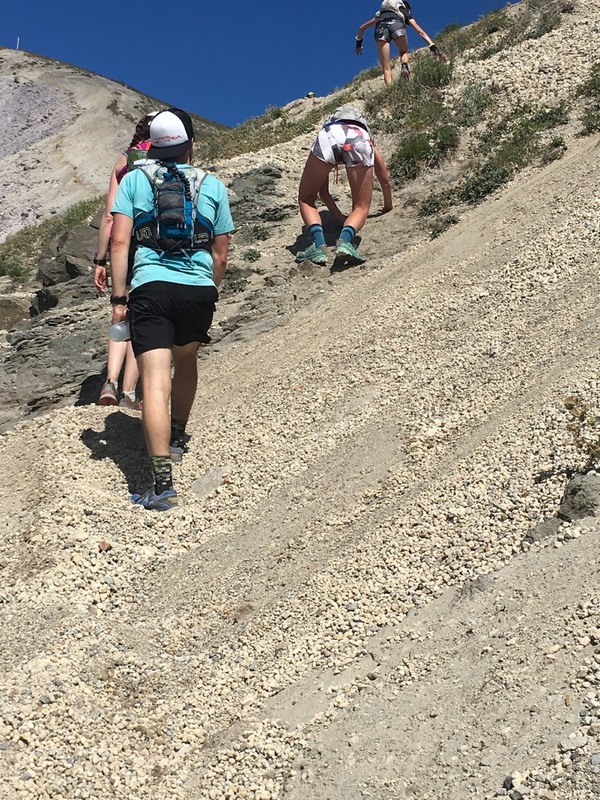 With each step down the hill, my hips and pelvis screamed with a bone-jarring pain. A nice woman who introduced herself as Laura ran with me for a bit, encouraged me and then took off. I slowed down, did a little walking (which I never do on the down hills), and took a few deep breaths. And then I just continued going forward. 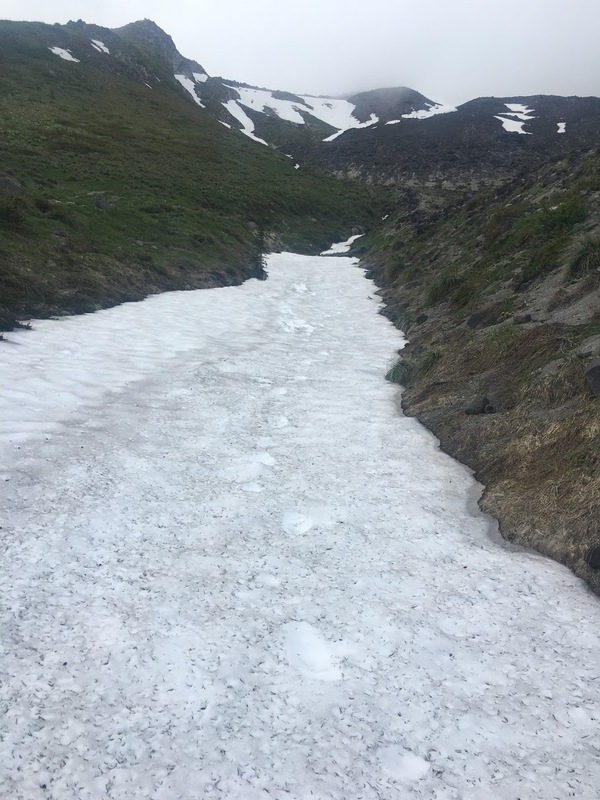 At this point, I was sure I would be dropping out and debated whether I would drop when we ran by Sun Mountain Lodge at around mile 22 or at the last aid station at around mile 25. It was just a matter of time. 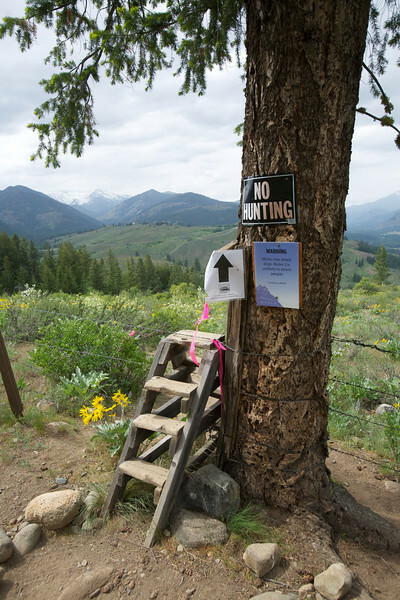 The trail bottomed out and was flat for a bit before climbing very steeply to Sun Mountain Lodge. I saw my running friend, Nicola run by looking strong (she finished 5th) as I struggled to make it up the ascent. 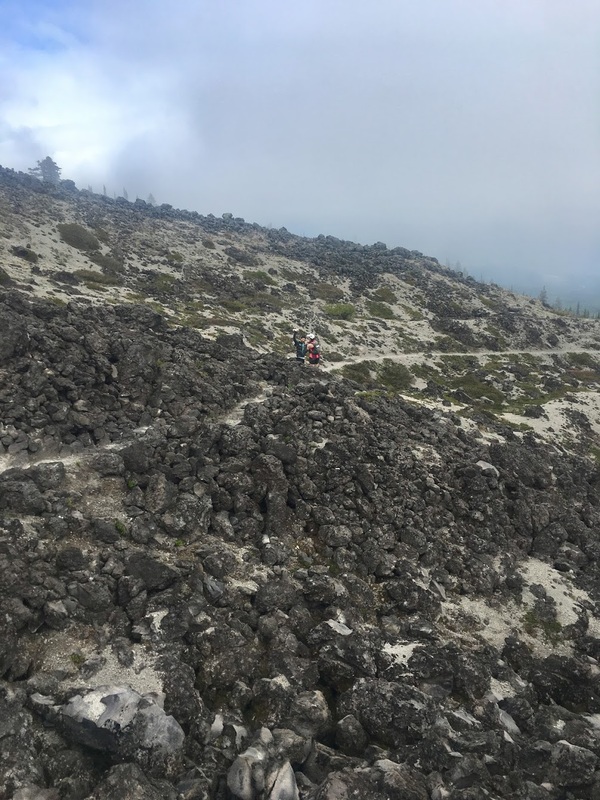 Once again, the poles helped as I struggled up, but it was the fact that in a few miles, I would turn around and descend this very steep incline that worried me the most. At the top, we then flattened out and ran by a bride and groom having their pictures taken on the lawn in front of the lodge. The course continued down past the lodge for another mile before turning around at small white sign in the middle of the trail. On the way down I had spied a large root with a loop that was raised several inches above the ground. I yelled “root” to the runner right behind me who yelled it to the guy behind her. About a minute after the turn around I looked up to see a guy trip and fly through the air. He must have missed the root. Fortunately, he tucked and rolled perfectly and was fine. We headed back up to the lodge and then back down the earlier very steep hill. Ouch, it hurt, but a little less than it hurt on Black Bear, for which I was thankful. At the bottom of the hill, things flattened out again and the trail went by Patterson Lake. In the distance I could hear what sounded like the third and last aid station. The din of cheering and cow bells got louder and pretty soon I was there at the Patterson Lake aid station at mile 25 (or mile 23 according to my watch). Suzanna was there, of course, and took my picture as I was approaching the aid station. 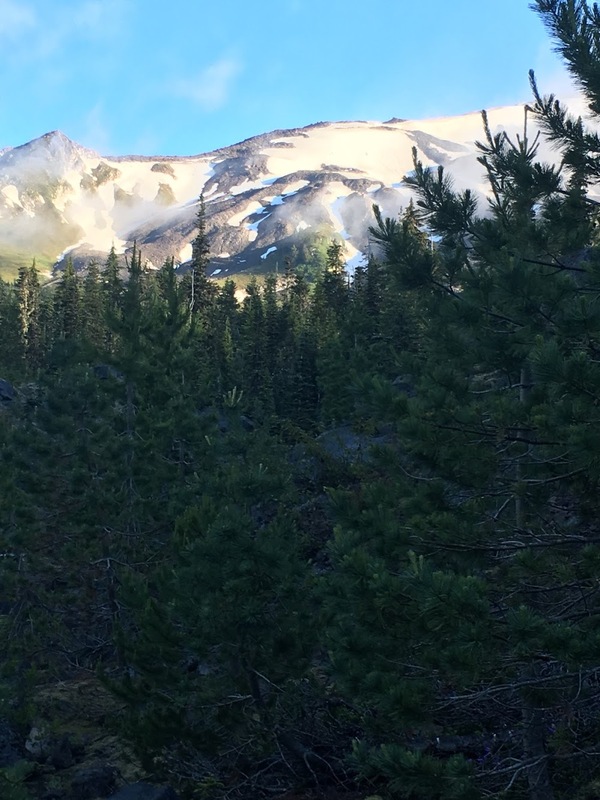 I rested a bit, chatted with Jess Mullen, who was working the aid station and who proceeded to tell me not to be fooled by the first false peak up Patterson Mountain. Suzanna and I talked. I discussed with her my options, which included dropping now and walking back the two miles with her and Porter to the finish as a DNF, or maybe, even if I walked the remaining 6 miles of the course, I guessed it which would take me about 2 hours and get me to the finish in about 7 hours, which was plenty of time before the 8 hour cutoff for the course. I mean what’s 2 more hours of suffering anyway? Did I mention that miraculously my bad ankle was not bothering me at all? The fact of the matter was that I would much prefer to finish the race, as long as I wasn’t seriously injured than drop out. Suzanna agreed that I should go for it and so it was decided I would continue and not take the easy exit. 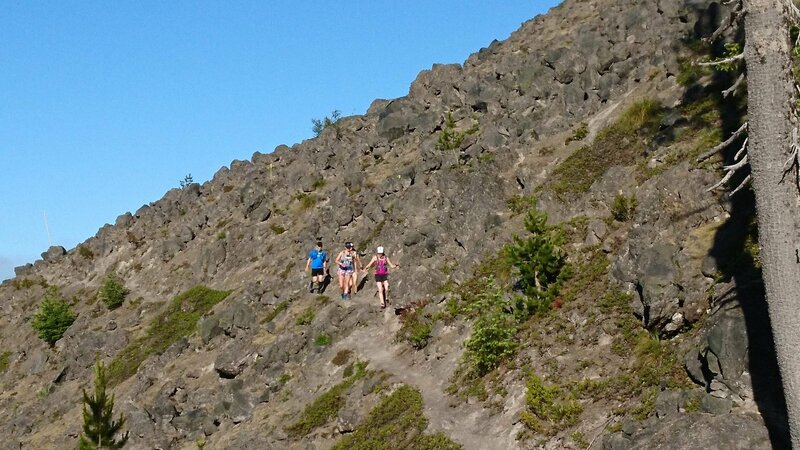 Patterson Mountain was the steepest of the three steep climbs of the race, ascending a little over a 1,000 feet over about 2 1/2 miles. 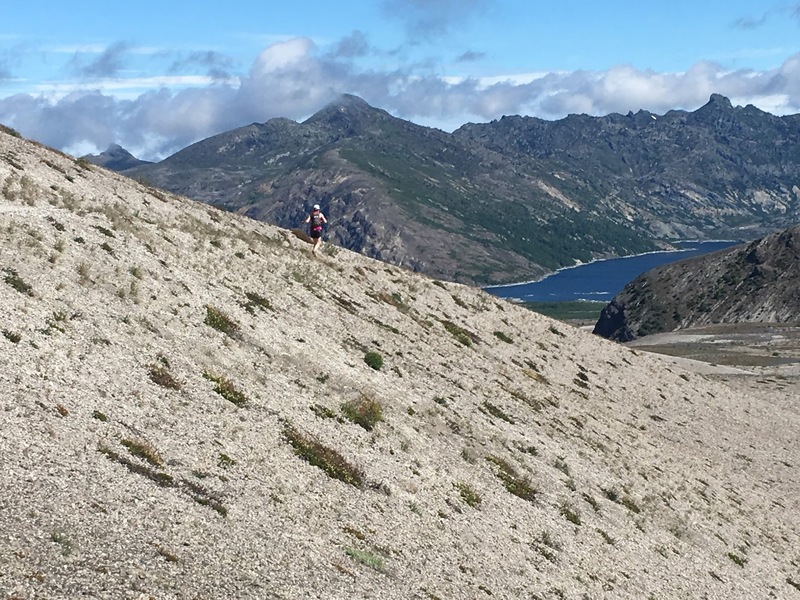 It was brutal, worsened by the fact that it was open so you could see all these runners in the distance slowly making their way up (and then back down) the mountain. I walked most of the way up and ran the few flatter spots. I made it to the turn-around and then headed back down the very steep decline. Amazingly, the bone-jarring pain I felt 7 or 8 miles earlier was gone. I mean I was exhausted and every part of my body hurt, but nothing like the earlier descent down Black Bear trail. I continued on. 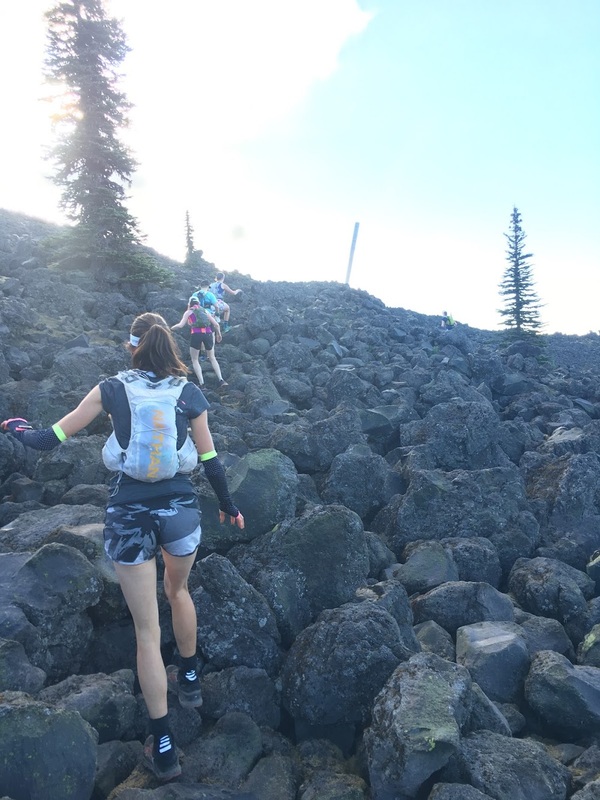 I should mention that one of the nice things about the out-and-back nature of the peaks of the Sun Mountain course, is that you saw people going in the opposite direction as you went up or down and almost everyone was there cheering each other. The people coming down when you were going up would usually throw you some encouraging words. “Nice job.” or “Way to go.” And when you, in your state of absolute exhaustion and self pity, were coming down the mountain, the people who were behind you by 20-40 minutes were smiling and praising you like you were some amazing super ultrarunner, making you feel almost accomplished, like you were fast or something, when you were pretty sure you were way slow. 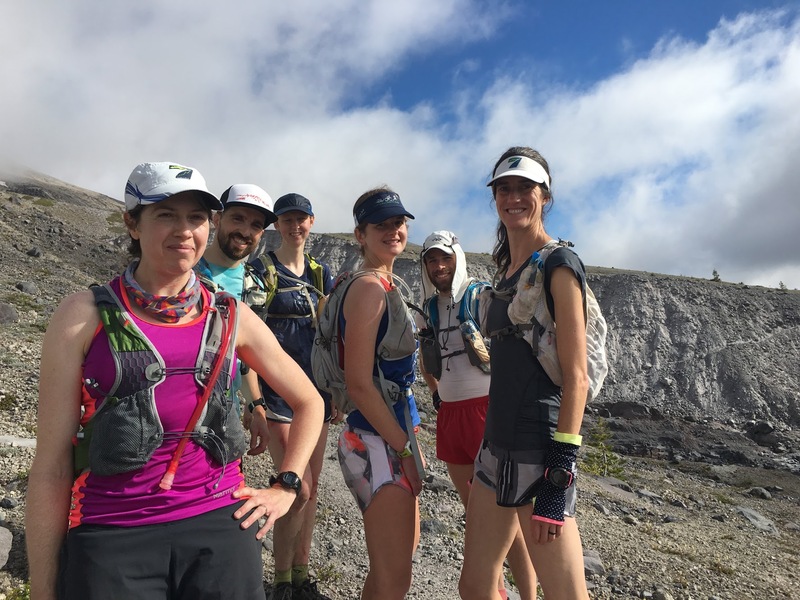 That’s the beauty of the ultrarunning community — almost everyone is nice and friendly. And despite my not feeling up to it, I tried to reciprocate with some encouraging words of my own. 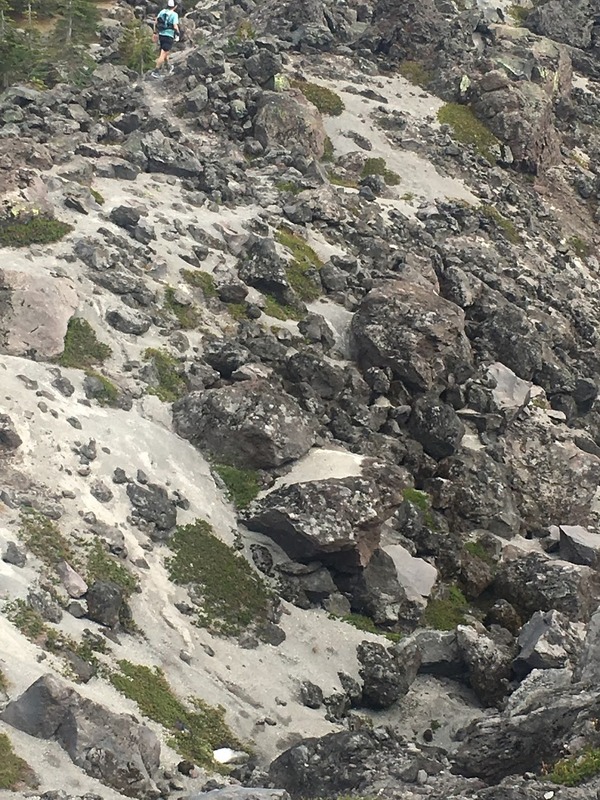 About half way down the mountain, I came to a T in the trail and instinctively, without reading the yellow sign, headed to the right to retrace my steps from earlier. Fortunately, a few steps later, I realized that I never looked at the direction of the arrow in the sign. I turned around, ran back to the sign, and saw that I was actually supposed to go left, not right and head towards the finish, not back to Patterson Lake aid station. A runner who was heading up the hill, yelled “good catch.” Boy was it ever. From there it was about 3-4 miles to the finish. I was alone for the next two miles on some technically difficult single-track terrain. Not difficult because it was very steep or because of any sheer drop offs, but difficult because we were running along a narrow dry stream bed (about 2-3 feet wide) with a rut carved right down the middle. Suffice it to say, that the footing was difficult, and I was worried about rolling my ankle. Fortunately, I managed to avoid any injury and made it to the road. I crossed the road and headed toward the finish. Since my watch didn’t agree with the map of the course that I had studied and printed before the race, I wasn’t sure how long I had to go. I was thinking it was anywhere between a 1 and 4 miles at this point, though I was thinking–okay hoping, wishing, and praying–that it was closer to a mile. At this point, it didn’t matter. I was committed and I was going to finish! After about a mile, I saw a sign for Chickadee trail, which was the trail we had started on and which I was reasonably sure would soon lead me to the finish. I dug down a little deeper and ran the shallow inclines instead of walking them like I desperately wanted. After another half mile or so, I started to hear the cheers in the distance. I quickened my pace and spotted Suzanna! She confirmed that the finish — which I couldn’t see at this point because of a remaining turn — was about 50 feet away. I accelerated across the finish, smiling big time, with a respectable time of 6:22. I did it. I stuck it out despite having a thousand excuses to quit. I simply refused to use any of those excuses. Not this race.